A beautiful course to play a round of golf is the Oliva Nova Golf Course in Valencia, Spain in Europe. As you look across the grounds of the immaculate upkeep of the Oliva Nova Golf Course in Valencia, Spain it entices any golfer to get out their clubs. 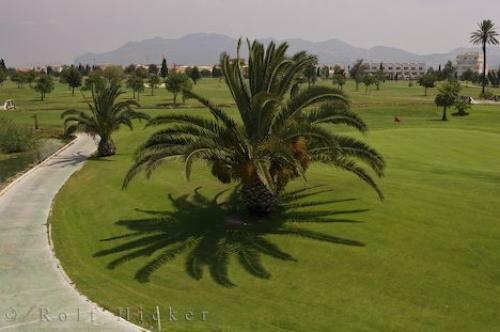 Situated close to the Oliva Nova beach the view is stunning from most of the holes with sunny days that are a regular occurrence in Valencia, Spain. The Oliva Nova Golf Course is a fairly challenging round of eighteen holes where water comes into play on a majority of them. The course covers approximately 50 hectares and is a par 72 course with greens and fairways that are always kept up to perfection. Professional golfer Seve Ballesteros designed this course in Oliva Nova, Valencia and it ranks high on the list of the top rated golf courses. Not only is water a main hazard on this course but you also have to deal with dog legs, difficult sand traps and putting greens where the lay of the green is extremely hard to read. Photo of the incredible layout of the Oliva Nova Golf Course in Valencia, Spain. ... A trip to Oliva Nova in Valencia, Spain is always very enjoyable and memorable but to play a round of golf at the Oliva Nova Golf Course makes your holiday seem complete. I photographed this photo with the digital SLR camera model Canon EOS-1Ds Mark II, aperture of f/8.0, exposure time of 1/125 sec. on ISO 100, as always I used a original Canon Lens, the focus lenght for this picture was 38mm.